Allow me to introduce Myself: I am a Clownfish. No joke! Where You'll Most Likely Find Me: We live on the ocean floor in the Pacific and Indian Oceans as well as the Red Sea and the Great Barrier Reef in Australia. We also like shallow lagoons. Betcha Didn't Know This About Me: Clownfish are hermaphrodites, which means they are born as boys and turn into breeding females when they mature or if their female leader dies. What's In a Name: Our name is derived from our bright colors that resemble a circus clown. 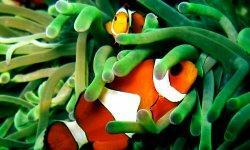 We also are called Anemonefish. Appearance: We are colorful, vibrant saltwater fish. There are 28 species of us all with different colors: orange, red, yellow, maroon among others. Three white stripes inside black lines run vertically on our bodies: between our heads, our middle bodies and our tails. Now I Know Where I've Seen Ya: Been racking your brain on where you've seen us before? We'll help you out. Nemo, the star of the 2003 Disney film "Finding Nemo" was a clownfish (his color was orange). Nemo's father, Marlin, was a clownfish too. Size: We are a tiny bunch. On average, we won't grow any larger than five inches long and can be as small as two inches long. Perfect Harmony: We have an extremely mutually beneficial relationship with anemones. In fact, we are best buds. Anemones look like flowers, but they are actually fish-eating animals with poisonous tentacles all over their bodies. After an anemone paralyzes and fatally wounds its prey, we eat the parts of the fish they don't want. In return, we eat the anemone's dead tentacles and protect them from underwater hunters. We don't get stung because over time we build up immunity to the anemone's deadly poising. Pop in the Tank: See these fish in action on the live clownfish cam from the guys at Acrylic Tank Manufacturing, home to Animal Planet's hit show Tanked.